See the: Egyptian Secrets Library. Ramesses II (Rameses, Ramses) built more temples than any other pharaoh of ancient Egypt. Each temple he endowed with giant statues of himself, lest anyone forget the source. Here in the desert west of Thebes, a few miles from his tomb, he built a temple intended only for the eternal worship of his memory, for Pharaoh is a god and after his death he joins the stars in the sky. Or so they said. The vaulted mounds are the grain storehouses of the temple estates. Made of mud brick, they still stand in the desert after 3300 years. "This, my lord, is the thinking-place of Rameses the Great." So said Ibrahim Ayyad to me one morning--Ibrahim, who is almost as prolific in the abrupt creation of peers as if he were a democratic government. I looked about me. We stood in a ruined hall with columns, architraves covered with inscriptions, segments of flat roof. Here and there traces of painting, dull-red, pale, ethereal blue still adhered to the stone. This hall, dignified, grand, but happy, was open on all sides to the Sun and air. From it I could see tamarisk and acacia trees, and far off shadowy mountains beyond the eastern verge of the Nile. Yea, no one returns again who has gone thither." It took the place of the song that had died as I thought of the great king's glory, that he had been here and had long since passed away. "The thinking-place of Rameses the Great!" "You must leave me alone here, Ibrahim." I watched his gold-colored robe vanish into the gold of the Sun through the copper color of the columns. I was quite alone in the "thinking-place" of Rameses. It was a brilliant day, the sky dark sapphire blue, without even the spectre of a cloud, or any airy, vaporous veil. The heat was already intense in the full sunshine, but delicious if one slid into a shadow. I slid into a shadow, and sat down on a warm block of stone. And the silence flowed upon me--the silence of the Ramesseum. Was Horbehutet, the winged disk, with crowned uroei, ever set up above this temple's principal door to keep it from destruction? I do not know. But, if he was, he failed perfectly to fulfil his mission. And I am glad he failed. I am glad of the ruin that is here, glad that walls have crumbled or been overthrown, that columns have been cast down, and ceilings torn off from the pillars that supported them, letting in the sky. I would have nothing different in the thinking- place of Rameses. Like a cloud he loomed over the Egypt that is dead. The same cloud looms over the Egypt of today. Everywhere you meet his traces, everywhere you hear his name. You say to a tall young Egyptian: "How big you are growing, Hassan!" He answers, "Come back next year, my gentleman, and I shall be like Rameses the Great." Or you ask of the boatman who rows you, "How can you pull all day against the current of the Nile?" And he smiles, and says to you: "Look! I am strong as Rameses the great." This familiar fame comes down through some thirty centuries. Carved upon limestone and granite, now it seems engraven also on every Egyptian heart. Thus can inordinate vanity impress its own view of itself upon the minds of millions. This Rameses is believed by some to be the Pharaoh who oppressed the children of Israel. from "la Description de l'Egypte"
As I sat in the Ramesseum that morning, I recalled his face--the face of an artist and a dreamer rather than that of a warrior and oppressor. Handsome he was, not insensitive, not cruel, but subtle, aristocratic, and refined. I could imagine him bending above the sistrums as they lifted their melodious voices to bid Typhon depart. And I could imagine him looking profoundly grave, not sad, among the columns with their opening lotus flowers. 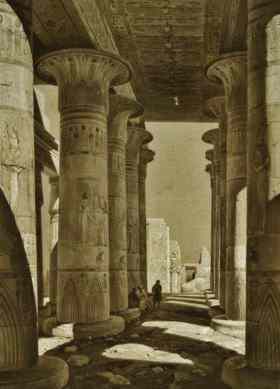 For it is the hall of lotus columns that Ibrahim calls the thinking-place of the pharaoh. There is something both lovely and touching to me in the lotus columns of Egypt, in the tall masses of stone opening out into flowers near the Sun. Near the Sun! 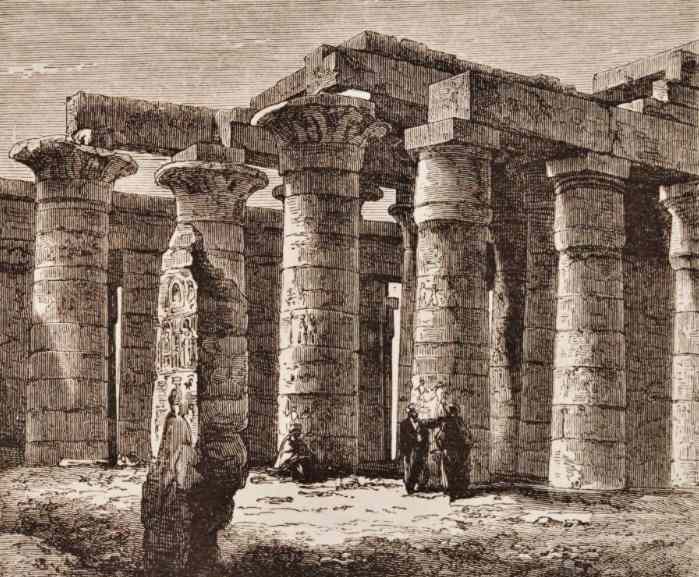 Yes, only that obvious falsehood will convey to those who have not seen them the effect of some of the hypostyle halls, the columns of which seem to soar to the sky. 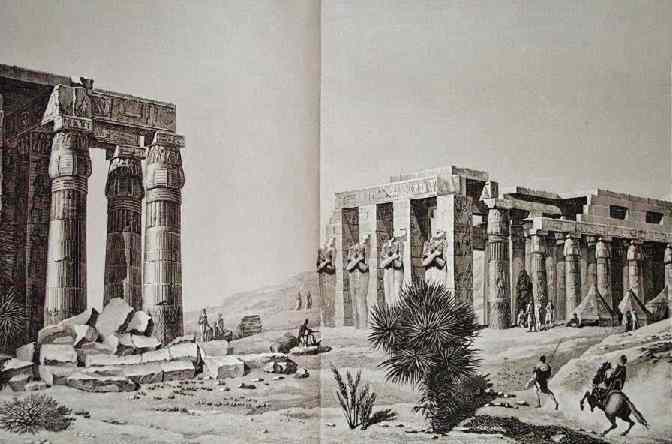 From La Description de l'Egypte, published c.1809. Flowers of stone. There was poetry in the minds that conceived them, in the thought that directed the hands which shaped them and placed them where they are. In Egypt perpetually one feels how the ancient Egyptians loved the Nymphaea lotus, which is the white lotus, and the Nymphaea coeruloea, the lotus that is blue. Did they not place Horus in its cup, and upon the head of Nefer-Tum, the nature god? To Seti I., when he returned in glory from his triumphs over the Syrians, were given bouquets of lotus-blossoms by the great officers of his household. The tiny column of green feldspar ending in the lotus typified eternal youth. Kohl pots were fashioned in the form of the lotus, cartouches sprang from it, wine flowed from cups shaped like it. The lotus was part of the very life of Egypt, as the rose, the American Beauty rose, is part of our social life of today. 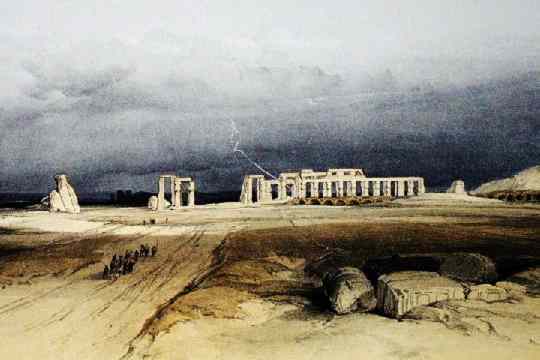 The Ramesseum by Samuel Manning, 1875. And here, in the Ramesseum, I found campaniform, or lotus-flower capitals on the columns--here where Rameses once perhaps dreamed of his Syrian campaigns. That famous combat at Kaldesh when, "like Baal in his fury," he fought single-handed against the host of the Hittites massed in two thousand, five hundred chariots to overthrow him. 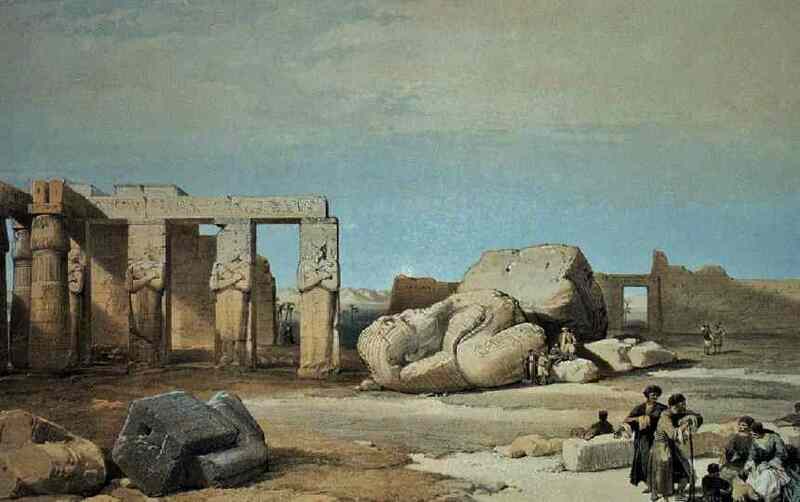 The Ramesseum is a temple not of winds, but of soft and kindly airs. There comes Zephyrus, whispering love to Flora incarnate in the Lotus. To every sunbeam, to every little breeze, the ruins stretch out arms. They adore the deep-blue sky, the shining, sifted sand, untrammeled nature, all that whispers, "Freedom." So I felt that day when Ibrahim left me, so I feel always when I sit in the Ramesseum, that exultant victim of Time's here not sacrilegious hand. All strong souls cry out secretly for liberty as for a sacred necessity of life. Liberty seems to drench the Ramesseum. And all strong souls must exult there. The Sun has taken it as a beloved possession. No massy walls keep him out. No shield-shaped battlements rear themselves up against the outer world as at Medinet-Abu. No huge pylons cast down upon the ground their forms in darkness. The stone glows with the Sun, seems almost to have a soul glowing with the sense, the sun-ray sense, of freedom. The heart leaps up in the Ramesseum, not frivolously, but with a strange, sudden knowledge of the depths of passionate joy there are in life and in bountiful, glorious nature. Instead of the strength of a prison one feels the ecstasy of space. Instead of the safety of inclosure, the rapture of naked publicity. This place of the great king is a public of Theban hills, of light airs, of drifting sand grains, of singing birds, and of butterflies with pure white wings. If you mount an Arab horse in the heart of an oasis, then ride him to the verge of the great desert, you will remember the bound, thrilling with fiery animation, which he gives when he sets his feet on the sand. A bound like that the soul gives when you sit in the Ramesseum. You see the crowding sunbeams, the far-off groves of palm trees, and the drowsy mountains, like shadows, that sleep beyond the Nile. And you look up, perhaps, as I looked that morning, and upon a lotus column nearby you perceive the figure of a young man singing. A young man singing! Let him be the tutelary god of this place, whoever he be, whether only some humble shepherd or the "Superintendent of Song for the King". Rather even than Amun-Ra let him be the god. For there is something nobly joyous in this architecture. It has been said, but not established, that Rameses the Great was buried in the Ramesseum, and when first I entered it the "Lay of the Harper" came to my mind, with the sadness that attends the passing away of glory. But an optimism almost as determined as Emerson's was quickly bred in me there. I could not be sad, though I could be happily thoughtful, in the light of the Ramesseum. And even when I left the thinking-place, and, coming down the central aisle, saw in the immersing sunshine of the Osiride Court the fallen colossus of the king, I was not struck to sadness. Imagine the greatest figure in the world--such a figure as this Rameses was in his day. His was all might, all glory, all climbing power, all vigor, tenacity of purpose, and granite strength of will concentrated within it. Then struck suddenly down, and falling backward in a collapse of which the thunder might shake the vitals of the earth. You have this prostrate colossus. Even now one seems to hear it fall, to feel the warm soil trembling beneath one's feet as one approaches it. A row of statues of enormous size, with arms crossed as if in resignation, glowing in the sun, in color not gold or amber, but a delicate, desert yellow, stand watch near it like servants of the dead. It is stupendous. That is obvious and that is enough. Nor does one think of its finish, of its beautiful, rich color, of any of its details. One thinks of it as a tremendous personage laid low, as the mightiest of the mighty fallen. One thinks of it as the dead Rameses whose glory still looms over Egypt like a golden cloud that will not disperse. One thinks of it as the man that commanded: and lo! 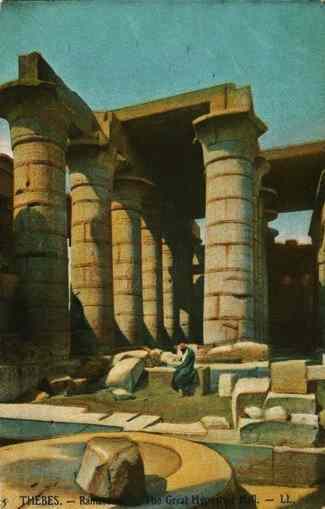 there rose up above the sands, at the foot of the hills of Thebes, the exultant Ramesseum. Behold my works, ye Mighty, and despair!" Hector Horeau, and Georg Erbkam (2).